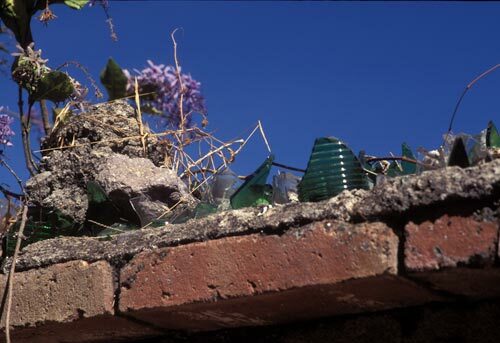 Single-minded security and glass recycling converge atop an exterior wall. Glass fragments cemented to the top of public walls are akin to pre-electronic security patrol signs that dot present day southwest suburbia. The message is loud and clear, “no trespassing”. 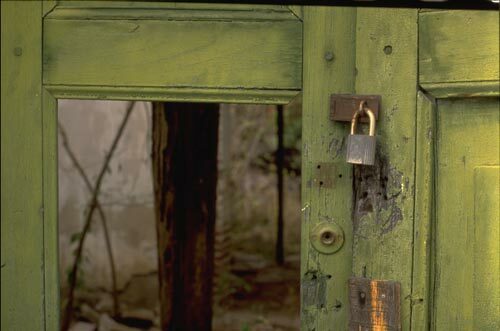 Would this “green” approach to home protection have stopped Carlos Conant and his 400 men from taking over Alamos in November of 1873 as they battled General Ignacio Pesqueira and his reformist Liberals. Conant collected $36,000 from Alamos merchants, to the victor goes the spoils. There seems to be something askew with this home security scheme. One wonders if a key still exists to open this lock? The door is proof that security devices come and go, in the above photo there are tell-tell signs of four previous systems. Would one of these have protected the property on February 8th, 1876 as Governor Jose Pesqueira took over Alamos and demanded money to support his cause and loyal troops? Alamos silver and business profits were a prize to be conquer by all factions in the midst of regional and national uprisings from 1855 through 1879. Today, the lock helps keep out large grazing animals. Well dressed scare-crow guards dirt and dry brush in late Spring. 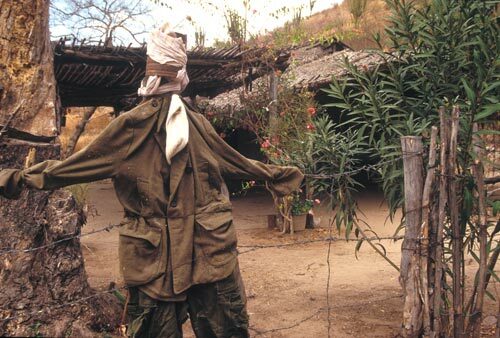 This attempt at security-scare-tactics doesn’t really look scary, it is more open arms warmly welcoming visitors. This casa, on the north bank of La Arroyo Aduana, sits on ground that would have been inundated during the October 1869 flood. 50 people died and 100 building in and around the Alameda were destroyed. This scare-crow was the best dressed scare-crow in Alamos. Boo!